If you’ve seen the $10-15 Airzooka, it’s a simple toy shaped like a pail with the bottom cut out. A flexible sheet on the other end is hooked up to a rubber band; when you pull back the sheet and release it, a toroid-shaped puff of air is ejected through the hole and travels to surprising distances. It is useful for annoying innocent people. I decided to make my own using cast-offs from other projects. 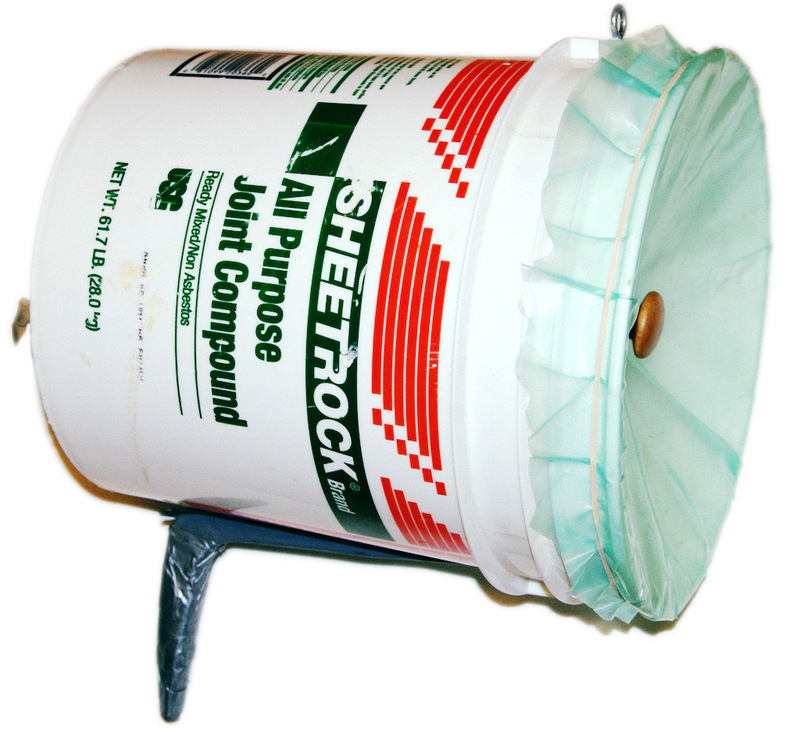 This “bucket-zooka” is made from an empty drywall compound (“mud”) bucket, a piece of plastic sheeting, some rubber bands, a shelf bracket, a drawer pull, generic bits of hardware, and a large rubber band. Total cost: About $3. It is easy to use and with a bit of marksmanship it can extinguish a candle flame at about 30 feet. It illustrates that air has inertia like any other mass. The emitted rotating ring is aerodynamically stable. Filling the bucket with smoke provides a nice way to visualize what’s happening. Kids love it. I think the pictures show the construction well enough to skip instructions. The only details I can suggest are that the plastic sheet (here, a piece of sturdy polyethylene vapor retarder, but a thick trash bag or equivalent would probably be fine) is held in place with some #64 rubber bands, and the really big main band came from a hardware store (it was the most expensive part at $2). A chain of smaller bands could probably be used. The main band at rest is under very little tension, and it has lasted several years. The plastic is loose enough that the distance from rest to fully pulled back is 8-10 cm (3-4″). 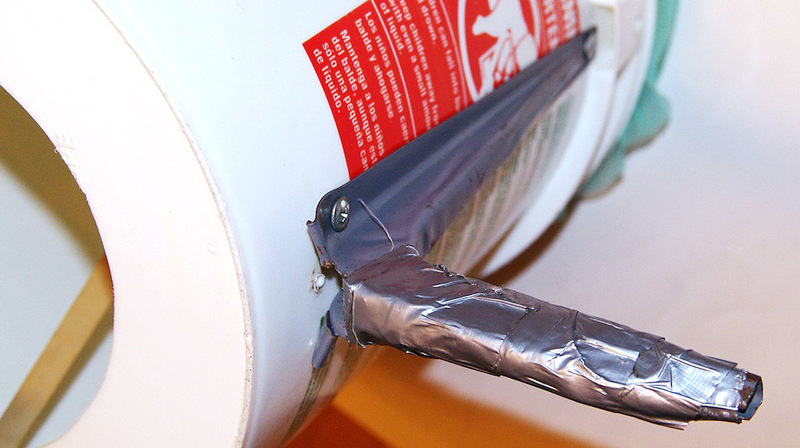 The band is attached to the plastic sheet with an eyescrew driven into the drawer pull; sandwiched fender washers reduce tearing. Placing the grip at the front of the bucket helped a lot with aim. The optimum size of the hole in the bottom of the bucket would make for an interesting experiment. 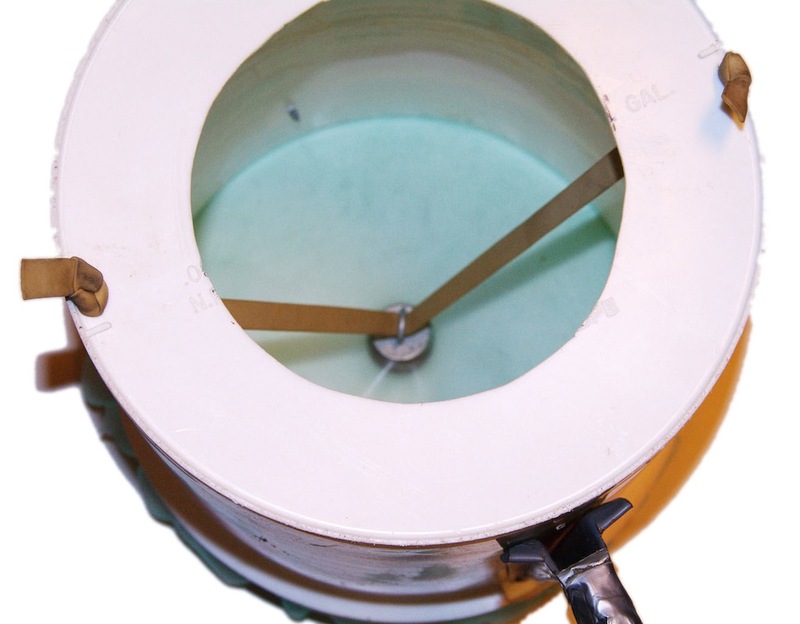 The bucket pictured has a diameter of 26 cm (10 3/8″) and the somewhat arbitrary hole is 16 cm (6 3/8″). My first prototype had too large a hole and didn’t work. « What If Everybody In Canada Flushed At Once?